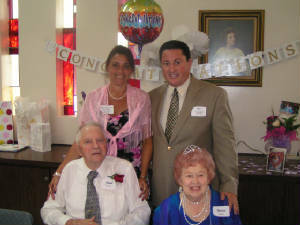 Paul and Irene White celebrate 70 years of marriage! On June 5th, Grandpa and Grandma White celebrated the 70th anniversary of their marriage with many of their family and friends at Yorba Linda United Methodist Church. Rhonda worked very hard to put this wonderful celebration together along with the help of a few of her friends and her mom, Shirley. The day was perfect! I remember walking up to Gare who was standing next to his grandma giving his little red head a hug, she had her head leaning on his chest and she said I just feel like I'm in a dream. She looked so happy!!! Grandpa fell the morning before, cracked a couple of ribs so he sat at the front table, and had a steady stream of well-wishers and an occasional trip down memory lane. Grandpa and Grandma were able to listen to some of the guest as they talked about how much they love and admire them both, the work they have done in the church, the role models they have been as parents and grandparents. I hope that you enjoy the photos of their special day.